Stems: Several arising from woody base, slender, much-branched, slightly woody, greenish, appressed-hairy. Leaves: Opposite, simple, sessile, linear, .4 to 1.2 inches long, to 1/8 inch wide, 1-3 nerved, appressed-hairy. Inflorescences: Heads, numerous, to 1.5 inch across, terminal on upper stems, barely elevated above leaves. Flowers: Involucral bracts oblong, overlapping; surfaces rough, glabrous or appressed-hairy; tips blunt, often reddish; ray florets 3-6, fertile, egg-shaped to circular, to 3/4 inch long, yellow; disk florets 18-24, fertile, corollas orange to red or greenish, 5-toothed. Fruits: Achenes, 3-angled, oblanceolate-linear, 1/6 to 1/5 inch long, awns 1-4, unequal or awns absent, enclosing small seed. Habitat: High plains; open dry areas; limestone soils. 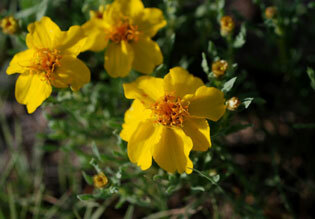 Uses: Native Americans steeped the plant and took the tea to treat kidney ailments, stomachaches and heartburn. They also used the liquid as an eyewash and as a wash for excessive sweating. The flowers were used to make a yellow wool dye and were ground into a paste to make red body paint. Comments: Named for Johann Gottfried Zinn, 1727-1759, German professor of medicine who did botanical work in Mexico. There is a story that he was accosted by bandits while collecting seeds in Mexico and they let him go because they thought he was crazy. Zinnia grandiflora is related to Zinnia elegans which is cultivated as an ornamental.